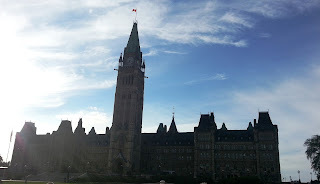 We got in line for tickets to tour Parliament. There is no charge for the tour of the Central and East buildings and no charge for the tour of the grounds. After going through minimal security, we were guided through the beautiful Central building which was rebuilt after a fire in 1916. The only part that survived was the wood adorned library. Parliament meets in this Central building. Canada has 305 members of the House of Commons who are elected and represent about 110,000 people each. The 105 senators are appointed to their positions by the Governor General. Jessica, our tour guide had only worked there for a month, but she was very entertaining and informative. As we walked around town, we found that Canadians follow traffic rules closely...no jaywalking or walking when the don't walk sign is posted. That was not true for the tourists. Outdoor restaurants are located throughout the city and we tried several of them. 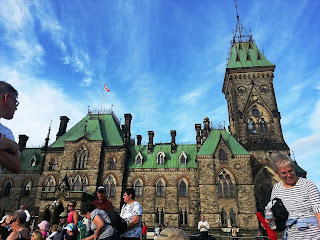 The light show on Parliament Center occurs nightly at 9:30pm and depicts the history of Canada...what a fabulous free show. We were joined by hundreds of people sitting on the lawn.